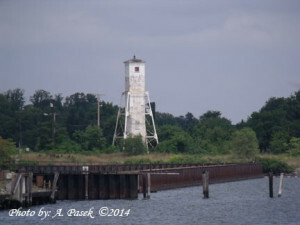 Craighill Channel Upper Range Rear Lighthouse – Chesapeake Chapter U.S.L.H.S. Craighill Channel Upper Range Light Rear (Cutoff Channel Range Rear) was built in 1886 and consists of an iron frame supporting a wooden tower that is covered with corrugated iron. A locomotive headlight was used as the original lantern and the keeper lived in a house next to the tower. The light was automated in 1929. The keeper’s quarters have been demolished. The lighthouse is located in railroad yards on the west side of Old Road Bay opposite Fort Howard. Site and tower closed to public. The Upper Range Lights were constructed to mark a new, upper, cutoff between Craighill and Brewerton channels.